Looking for a fun way to entertain the kids while taking a break from the beach in Waikiki? Planning a trip to Honolulu and want to spend a little time indoors cooling off without boring your kids? Look no further than the Waikiki Aquarium. While it appears to be tiny from the outside, there is more than meets the eye at this family-friendly attraction. Read on to find out why this is a great place to take your kids during your trip to Hawaii. The Waikiki Aquarium showcases both indoor and outdoor exhibits. 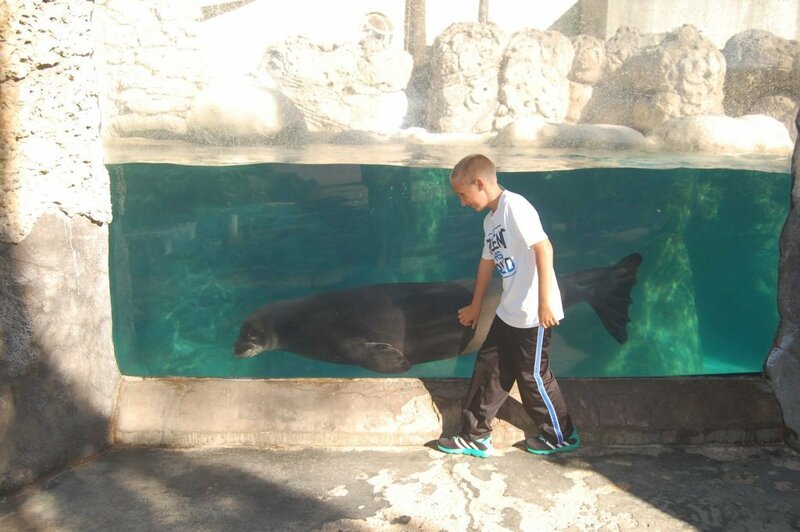 In the outdoor exhibits, you can watch the endangered Hawaiian monk seal play and swim. You can also get up close and personal with small hermit crabs and sea urchins. 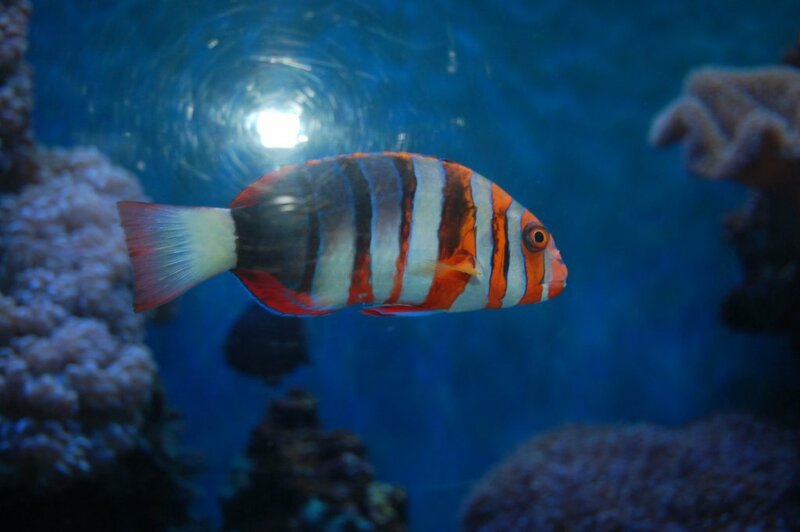 Additionally, there is a coral reef exhibit featuring many of the fish found in the waters surrounding the Hawaiian islands. 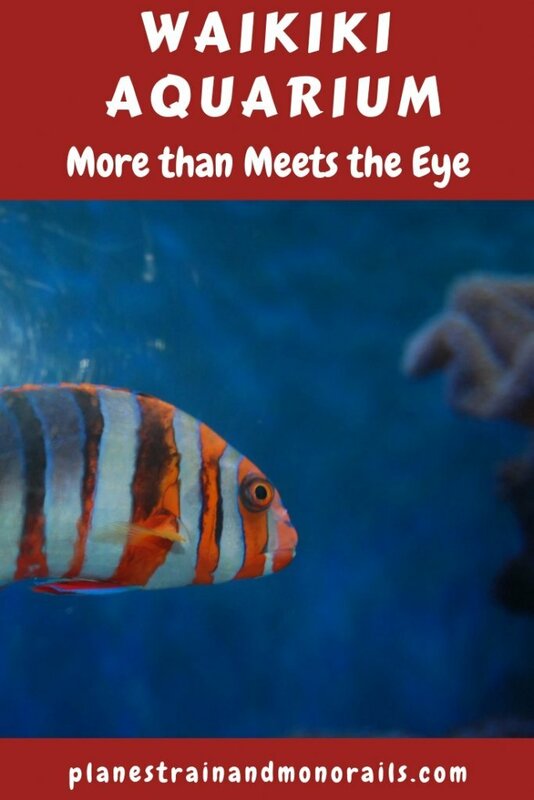 The tank is built to give you both an above and below water view of these beautiful fish. My son thought the Hawaiian Monk Seal was fun to watch. The indoor exhibits are laid out in an organized fashion which allows you to easily move from one tank to the next. 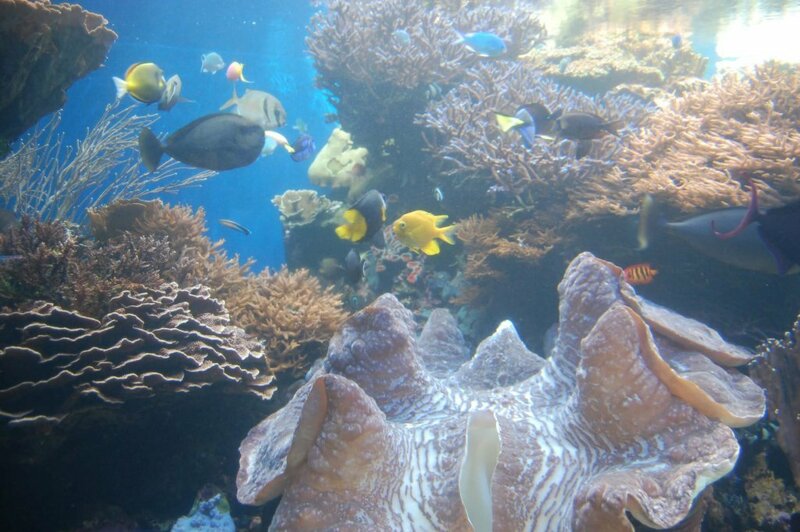 One section features coral reefs and their inhabitants. Another section is dedicated to river creatures, while a third area houses a variety of sea horses. The largest tank features a zebra shark and a giant grouper. The Waikiki Aquarium is open seven days a week from 9:00 am to 4:30 pm. It is closed on Christmas Day and Honolulu Marathon Day, however. On Thanksgiving Day, you will find special holiday hours of 9:00 am to 2:30 pm. And on New Years’ Day, the aquarium is only open from 11:00 am to 4:30 pm. Admission to the aquarium is very reasonable. For persons age 13-64, cost of admission is $12 per person. For kids ages 4-12, the price is $5 per person, and kids 3 and under get in free. The aquarium offers a senior discount for those 65 and older of only $5. Active duty military personnel can enter with their military ID for only $8. 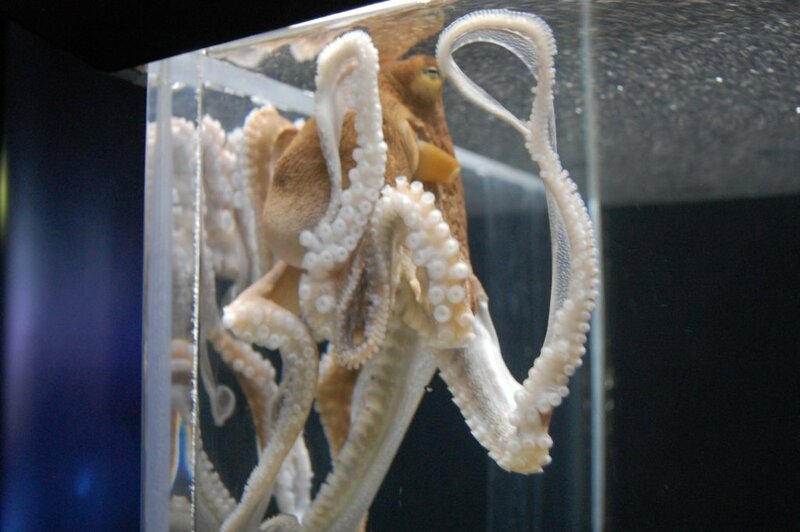 Get an up close look at an octopus. The Waikiki Aquarium is conveniently located just a short walk down the street from the famous Waikiki beach and the Honolulu Zoo. It is located on the shoreline across from Kapi’olani Park on Kalakaua Avenue. There are a few free parking spaces in front of the aquarium. You can also park in a metered spot across the street from the aquarium. There are a lot of reef fish to see. While the Waikiki Aquarium packs more into this small space than it appears possible, it will still only take you an hour or two to adequately experience the entire aquarium. So, it is easy to enjoy the exhibits without devoting your entire day to this one activity. Feel free to start with either the indoor or outdoor exhibits. I would recommend going the opposite direction of any visitors in front of you to avoid bottlenecks. If your kids are like mine, they will want to go back and forth several times during your visit. Because of the small size, this is easy to do. The aquarium does allow reentry on the same day if you get your hand stamped before leaving the first time. There are some beautiful fish at the aquarium. The Waikiki Aquarium is a small but entertaining attraction located just down the street from Waikiki beach. It is a great place for families to get out of the sun for an hour or two and learn about the amazing marine life that thrives around the Hawaiian islands. 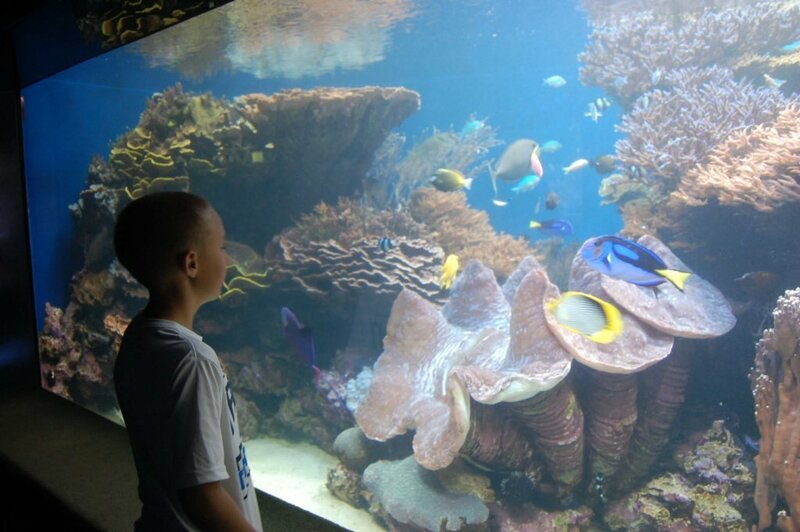 If you would like to have more information on the aquarium, visit their website. For more ideas on what to do in Honolulu, see my post on the Honolulu Zoo. For places to eat in Honolulu, see my posts on Lulu’s and Maui Brewing Company. 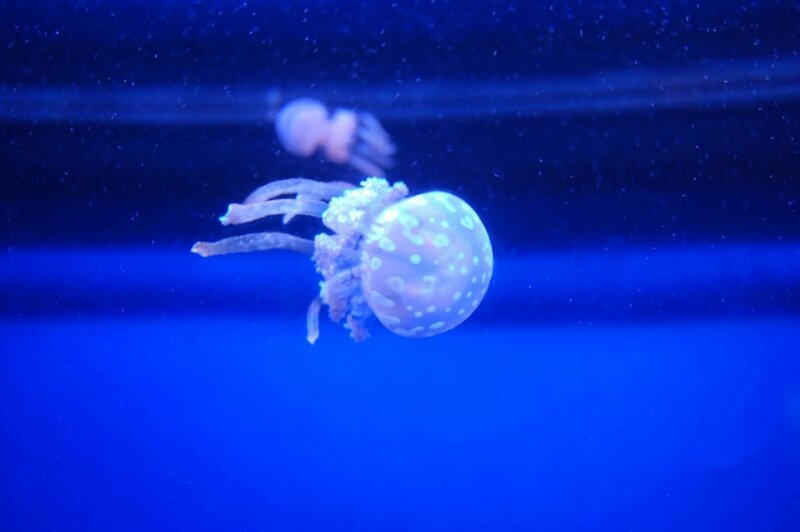 Have you visited the Waikiki Aquarium? Leave a comment and let me know your thoughts. Happy travels!